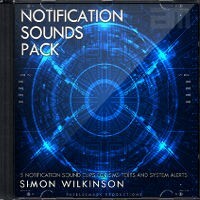 Sound effects, system notifications, short audio idents, branding and other sound design elements from composer Simon Wilkinson. Pack of 5 short notification type sounds for SMS/text notifications and system startup sounds and alerts on your phone, tablet or PC. Each of the 5 short tracks are 9 seconds or less with an atmospheric feel. Buy the pack of 5 mp3s for your own personal use for £0.99 or license them for commercial or non-commercial use by selecting from the options below. 15 second Hollywood style company logo fanfare starting with trumpets and French horns building to full orchestra and percussion hit. Ideal introductory music for company logo, credits, opening title sequence or similar intro at the start of a film or video production.